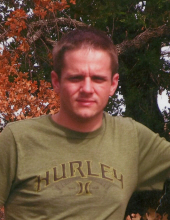 Jamie Reed Crawford, 32, of Elk City, Oklahoma was born on July 1, 1986 in Elk City, Oklahoma to Robert Reid Williams and Denise Lavonne Crawford. He went to meet his heavenly Father on April 3, 2019 in Elk City, Oklahoma. He attended school in Elk City, where he also played in the marching band during high school. He graduated from Elk City High School in 2005. His passion was making music, writing songs and mixing music. He worked at the Lizard Lounge in Dallas, Texas as a professional DJ. Jamie loved his family. He loved his boy, Alexander and miss Isabell. Jamie was his momma’s best friend. Cherishing his memory is his mother; Denise Crawford of Elk City, Oklahoma; one daughter; Isabell Squires of Elk City, Oklahoma two brothers; Jonathan Kane Williams of Weatherford, Oklahoma, Bo Williams of Elk City, Oklahoma; one sister; Mariah Kae Williams of Weatherford, Oklahoma; one brother-in-law; Cody Chronister of Weatherford, Oklahoma; one grandmother; Olene Williams of Elk City, Oklahoma. He is preceded in death by his love; Erin Lee; son; Alexander Crawford; father; Bobby Williams; grandparents; Kenneth and Claira Crawford; grandfather; Elmer Williams. To send flowers or a remembrance gift to the family of Jamie Reed Crawford, please visit our Tribute Store. "Email Address" would like to share the life celebration of Jamie Reed Crawford. Click on the "link" to go to share a favorite memory or leave a condolence message for the family.